The beauty of The Lowry Theatre is that it’s actually several theatres. This allows them to showcase the talent of tomorrow as well as champion the stars of today. Especially so when it comes to comedy. 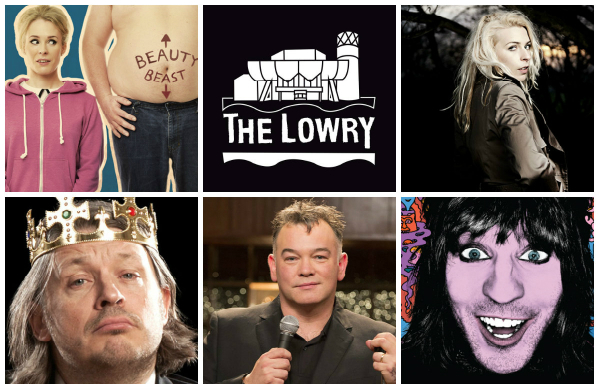 We’ve rounded up some of the best shows coming up in the next few months on the Salford Quays. In a show that was nominated for Best Comedy show at 2014’s Edinburgh Fringe Sara Pascoe takes on history and how it defines us to this day. The droll delivery of Pascoe serves her subject matter as she leaps from one disparate topic to the next. Musings on monkeys, Kim Jong-il and various wars make this a must see and very intelligent show about why we are the way we are. The man who relaunched the Jacobean ruff and made capes accessible once more makes a welcome return to stand up in his own inimitable way. Using animation, characters and sketches this is as much a variety show as it is straight stand up comedy. Bringing with him pals from his ‘Luxury Comedy’ TV show Fielding’s surreal and diverse set is a treat for fans of the Mighty Boosh funnyman. Though slightly outdated as a title, it killed whilst in Edinburgh back in August, Lucy Beaumont’s natural and down to earth comedy charm more than makes up for the zeitgeist-y show header. After winning the BBC New Comedy Award in 2012 Beaumont’s career has taken off and it won’t be long until she’s makes the move from The Lowry’s Studio to the larger Lyric stage. Squeezing in three shows to a two day stint at The Lowry comedy’s favourite self aware Uncle is here to ruminate on all that gathers his ire in modern life. Surrounded by ‘Britain’s Best Comedian’ tags, Lee is very much a comedian’s comedian, simultaneously breaking down the nature of stand whilst extending the format and creating something entirely new. Former (comedy) partner of Mr Lee, Richard Herring will also be gracing The Lowry with his presence this February. After a host of shows assessing grand themes such as death, love and religion Herring has taken it down a notch as he pieces together a performance about the simple joys in life and anecdotes based around treats like bouncing on a sofa. An intelligent and vibrant performer who is still one of the UK’s best and certainly most prolific. John is a freelance writer working for the likes of Creative Tourist, Time Out, The Skinny and Manchester Wire. He lives in Manchester and was once voted fifth funniest at his Sixth Form.